Where’s Bernie Sanders when you really need him? The socialist scold — who’s usually out of his mind about corporate perks and privilege— has been remarkably quiet about the contract negotiations going on for NFL commissioner Roger Goodell. 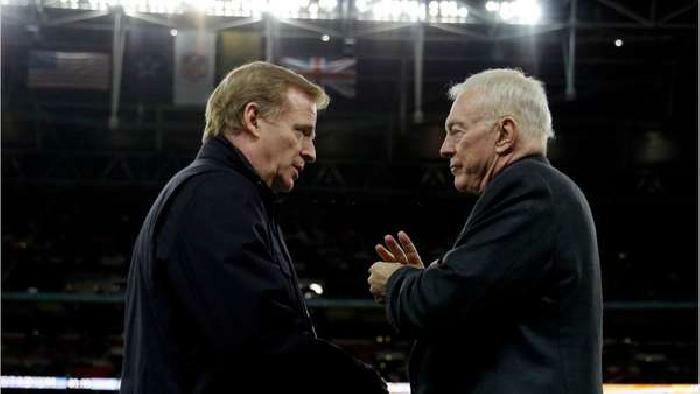 According to anonymous source— oh hell, we all know it’s Dallas owner Jerry Jones leaking like an old scow—the current commissioner is asking for compensation somewhere in the $50 M. U.S. a year. Plus platinum healthcare for him and his family— as long as they live. This is not as big a bump in salary as you might expect. Goodell has been pulling down an estimated $44 million a year under his current deal, including the same platinum healthcare he wants for himself and the entire Goodwill brood for life. As we’ve said here before, if Goodell were a QB in his league we’d say he’s slow to react tom pressure and always making bad reads in coverage. Under Roger’s unsteady hand, the league has swung wildly from punishing players too little to punishing players too much. The league’s marquee player, Tom Brady, was somehow dragged through the mud over deflated footballs, for pete’s sake, while domestic assault suspects were given kid-glove treatment for popping women. Until they were then given draconian suspensions to compensate for Goodell whiffing on his original punishments. Now he’s locked in a death struggle with the Cowboys powerful owner Jones over the six-game suspension to star running back Ezekiel Elliott, which was dragged through the courts for months with Elliott only agreeing to the suspension past week. Jones is now promising legal vengeance if Goodell gets his contract demands. Goodell has publicly threatened Jones with losing his team if he doesn’t desist. So much for not washing your dirty linen in private. Goodell has also been the point man as the league fumbled the concussion crisis which now threatens the existence of the NFL and all levels of football. Movies, TV programs and books made the NFL out to be a heartless exploiter of young men’s health while the owners bathed in millions. Goodell stammered about inexact science. Not a good look. Then there was teams shuffling. While he sat in the plush chair, three franchises re-located— two of them to Los Angeles where the public has been lukewarm over the new neighbours. The Oakland Raiders are now due for Las Vegas— even as they bleed Oakland for more guilt money. There have been other gaffes, but this tepid resumé more than sums up the legacy of Goodell since becoming commissioner in 2006. Yet for some reason Jones’ colleagues in the NFL want him back at a bloated compensation. Nice work if you can get it. But this shouldn’t surprise anyone watching corporate America’s tin ear about inequality. As Red Bernie is eager to point out. Just look at few of the baffling benefit packages accorded CEOs around the world of the private jet. Take, for example, CEO Marissa Mayer, who drove Yahoo into the ditch. Yahoo lost the ad wars to Google and Facebook and bet billions on new businesses that have failed to take off. Yahoo had some very conspicuous privacy breaches. For Yahoo’s boss, however, screwing up big time could bring her up to $137m in severance as the company tries to get away from its high-profile loser. Another example? Jeff Immelt ran General Electric for 16 years. In that time, GE stock lost 30 percent of its value under Immelt’s reign of error. GE was the worst performer on the Dow Jones exchange in that period. For this his severance package is estimated at $219 million in addition salaries and benefits. To say nothing of DreamWorks CEO Jeffrey Katzenberg’s who received a more than $391 million cash-out package when his company was sold. At least Katzenberg could claim some successes. Goodell? Ask the players in his league how much they thought of his executive run atop the NFL. So while Goodell is in this well-compensated company it’s probably not a club any self-respecting capitalist wants to belong to. Perhaps if Colin Kaepernick had employed his well-used knee to protest this kind of sports inequality he might have just about everyone who’s not an NFL were on his side. Eskimos Offensive? Whose Harm? Whose Foul?